Being in a room during a Lisa Yee presentation is a bit like going to a lighting warehouse. The brightness! The heat! It's a thing to behold. But truly. I've attended a number of breakout sessions with her at L.A. conferences, and I always come away feeling Lisa Yee, Peepy, and their books inspired, informed, and newly recharged. 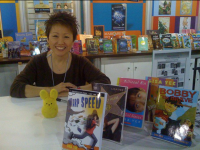 I also adore her books: The Millicent Min universe (with inspired companion titles featuring Emily Ebers, Stanford Wong, most recently Marley Sandesky, about a boy running away from bullies); the pitch-perfect Bobby books, which are illustrated by the unstoppable Dan Santat; and Absolutely Maybe, her first foray into YA. Lisa even has a couple of American Girl titles. Lisa is seriously funny, but her stories have heart and depth. It's no wonder she was the second recipient of the Sid Fleischman Award (the dearly departed Sid won the inaugural award, which is given to acknowledge the often-overlooked funny books). Finally, there is no mentioning Lisa without also mentioning Peepy, her fauxshmellow peep. When did you go to your first SCBWI conference as a participant? What was it like? My first conference was about 11 years ago, maybe 12? I was scared to death. Didn't know anyone. Didn't even know if I should be there because I was unpublished. However, once I arrived, I knew I belonged. I learned so much that I thought my head would explode -- but in a good way. It was exactly what I needed to get out of my rut and start taking writing seriously. You’ve published, what, 10 novels now? Does it get easier? What are some of the things you’ve learned along the way? Ten?!!! Sometimes I can't even believe it. It seems like it took forever to get that first one published, but yes. Yes, it gets so much easier. And no, no, it doesn't get any easier. Um, maybe I should explain that. That first novel, MILLICENT MIN, GIRL GENIUS, came out in 2003 and took over six years to write. I was working full-time and had two young kids. However, the main thing that impeded the writing was me. I was scared and didn't know what I was doing. That's why the SCBWI conferences helped. Once that book came out, I had been through the process and knew what to expect. So things got easier. Now I can write a book or two a year. However, each time I start, all the old fears and worries bubble up. Can I do this? Why would anyone want to read it? What if I fail? The only difference is, I shove those thoughts aside earlier and get to the work of writing, because now it's my job. I’ll be attending your seminar on Bullies. Will there be demos? Should I worry that I’m going to get a swirly? Not to worry, there will be no swirlies -- well, unless you get a question wrong. In that case, you will get a swirly, then be shoved into a locker. Seriously though, we're going to have a great time learning how to create wonderful, evil, heartbreaking bullies. And, hopefully, in the process, we'll learn more about ourselves. What does Peepy plan to wear to the pajama party? Let me ask her . . . Okay, I'm back. Peepy acted all mysterious and refused to give me a straight answer. Which means, she hasn't decided yet. So many designers are vying for her to wear their creations. Here's a trailer for her latest book, Warp Speed. Lisa is on Facebook and Twitter. Haven't registered for the conference yet? You can do that right here.